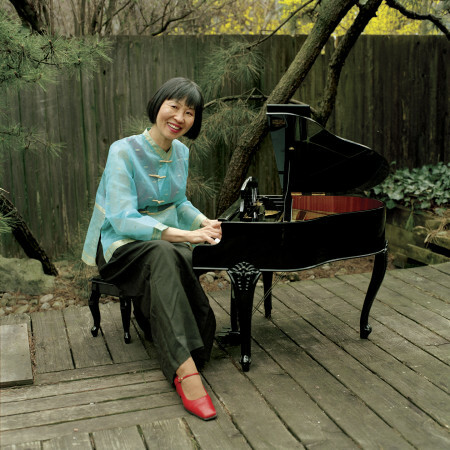 Margaret Leng Tan is an internationally celebrated artist renowned for her performances of American and Asian music that transcend the piano’s conventional boundaries. She has perfected an individual style integrating sound, choreography, and theater that has inspired many composers to create performer-specific works for her including John Cage, Tan Dun, Alvin Lucier, Somei Satoh, Toby Twining, Aaron Jay Kernis, and Julia Wolfe. The world’s first professional toy pianist, Ms. Leng Tan has transformed a toy into a legitimate instrument, inspiring composers to create an adventurous new repertoire for her toy pianos and toy instruments. Leng Tan was the first woman to graduate with a doctorate from The Juilliard School, and is a recipient of The National Endowment for the Arts’ Solo Recitalist Award. Her groundbreaking album, The Art of the Toy Piano (Point Music/Universal), has received widespread critical acclaim. A native of Singapore, she currently lives in Brooklyn, New York, with her four dogs, three Steinways and, at last count, fifteen toy pianos. John Kennedy is widely regarded as one of America’s foremost proponents of new music. He has since 1990 been Director of the Music in Time series at the Spoleto Festival USA, where he conducts the Spoleto Festival Orchestra and guest artists in performances of experimental as well as mainstream contemporary music. Mr. Kennedy is Artistic Director of Santa Fe New Music, which he founded in 2000, and New York’s Essential Music, which he co-founded in 1987 and with whom he has led performances at nearly every major venue in New York, including The Kitchen, 92nd Street Y, and Lincoln Center. The Winged Energy of Delight is a suite of four pieces that celebrates the mastery of patterns with four qualities of childhood: exuberance, reflective reverie, joy, and sweet slumber. The last movement, Lullaby, calls for the performer to play toy piano with the left hand and rub a sandblock with the right. The title comes from a poem by Rilke: As once the winged energy of delight / carried you over childhood’s dark abyssess, / now beyond your own life build the great / arch of unimagined bridges. Written for Merce Cunningham’s dance, Diversion, John Cage’s Suite For Toy Piano is the first-ever bona-fide composition created for the toy instrument. Its five short movements use only nine consecutive white notes and can ostensibly be performed on any toy piano, perhaps even one with painted black keys. One of the most charming and whimsical of Cage’s compositions, it is filled with Cagean irony and humor as in the exaggerated dynamic extremes from sffz to ppp. As if a toy piano could have such capabilities…Nevertheless, the pianist tries her best and from the effort subtle differences emerge. Toby Twining created this version of Eleanor Rigby at my request, as I thought this popular Beatles song would be a potent evocation of 60’s nostalgia when heard on a toy piano. Stephen Montague’s toy Tarantella has all the hallmarks of the dance reputedly created to exorcise the sting of the Tarantula: great rapidity, perpetual motion and the use of 6/8 time. Designed to show off the virtuosic capabilities of my newly-acquired Schoenhut toy grand piano, Montague wrote Mirabella sight unseen (sound heard over the telephone), and with strict admonitions not to exceed its three-octave compass. American-born and educated, Stephen Montague has lived in Britain since 1974 and is renowned for his pioneering works combining live instruments with live electronics. The first section of She Herself Alone was originally written for toy piano and psaltery as incidental music for a play, Who She is Herself, in 1996. Composer Laura Liben writes: “When I heard Margaret play the toy piano I thought of her perhaps playing this piece, but it was five years before the tape could be located and there was no written music. Margaret asked me to add more material, to ‘finish the piece’ as it were, and that’s how She Herself Alone for toy piano and toy psaltery came about.” Laura Liben currently composes and performs with the new music percussion ensemble, Gamelan Son of Lion. One of her works is on their recent album, Bending the Gending. Frederic Rzewski is an American composer presently living in Belgium, whose music is often focused on political and social issues. He is best known for his epic piano solo, The People United Will Never Be Defeated, a set of variations on the Chilean protest song, “El Pueblo Unido Jamas Sera Vencido.” To the Earth is scored for one musician playing four flower pots, who recites a text based on a Homeric hymn. Henry Brant was born in 1913 and is still an active composer, winning the 2002 Pulitzer Prize in Music. He has been a pioneer in composing “spatial music,” in which performers are situated around and amidst the audience. Music for a Five and Dime is one of his first works and exists in at least four versions. When he composed it, in 1932, he was in New York and perhaps influenced by the circle of composers around Henry Cowell, including William Russell, who was also composing many jazz-tinged works for kitchen hardware and other found objects. One of the world’s foremost pioneers of electro-acoustic music, Alvin Lucier created Nothing is Real for the pianist Aki Takahashi’s Hyper-Beatles album series. Scored for piano, teapot and miniature sound system, the pianist first records herself playing the melody of the Beatles song, Strawberry Fields Forever. The recording is then played back through a speaker hidden in a teapot. During playback the ensuing resonances are manipulated by opening and closing the teapot lid. The “Nocturnal Music” movement is an uncanny anticipation of Minimalism and ambient music. Since Bela Bartok’s Musiques Nocturnes is, for the most part, made up of repeated motivic fragments above an ostinato, I had little difficulty extracting a toy piano version from the original piano score. In “orchestrating” the piece, I have taken the liberty of complementing Bartok’s evocative sounds of the night with ambient effects drawn from my toy arsenal supplemented by John Kennedy’s percussion resources. Berceuse is from Stundenbuch, an anthology of 48 piano miniatures by the German composer, Hans Otte. He sent it to me thinking it would lend itself to the toy piano. I have since adapted several others in the collection as well. For my new-found instrument, I thought Philip Glass’ Modern Love Waltz, with its limited range and naive music-box-like figurations, would be an ideal candidate for the toy piano. Happily it has turned out to be one of my most successful transcriptions and lends credence to my conviction that certain pieces were meant to be heard on the toy piano. Renowned accordionist/composer Guy Klucevsek adapted the toy instrumental suite, Sweet Chinoiserie, for me from his Chinoiserie, a music/theater collaboration with Ping Chong and Company. Sonically and visually it is the most colorful work in my toy repertory, enlisting a battalion of toy and kitchen percussion and other toy instruments such as the melodica and of course, the toy accordion. The title of the suite’s third movement, The Mark of a Hero, derives from the brand name of my toy accordion. Satie Blues, for toy piano and piano, is the first-ever composition featuring this unique blend of instruments. While the opening motif alludes to the third Gnossienne of Erik Satie, Nightmare Rag is a slice of modern-day Americana laced with sly allusions to the 70’s TV hit show, The Addams Family. Composer/vocalist Toby Twining can be heard with his a cappella ensemble, Toby Twining Music, in his critically acclaimed Chrysalid Requiem on Cantaloupe Records. Raphael Mostel is renowned for his Tibetan Singing Bowl Ensemble and his chamber narrative, The Travels of Babar. The toy piano, however, inspired this flag-waver in celebration of the great American tradition of freedom (with apologies to Jasper Johns).